Chaya Someshwara Temple is well known for its architecture & mysterious shadow that falls on the deity. Here, Lord Shiva is worshiped as Someshwara Swamy. Because of the shadow, the temple is called as Chaya Someshwara Alayam. The temple has three Garbhagrihas that houses three deities Brahma, Vishnu and Maheshwara, hence it is also called as “Thrikutalayam”. The Garbhagriha situated on the west and facing east is dedicated to Lord Shiva. We can see a constant and continuous shadow of a pillar on Shiva Lingam throughout the day. There is another architectural wonder apart from this Shadow which falls on the deity of the temple. 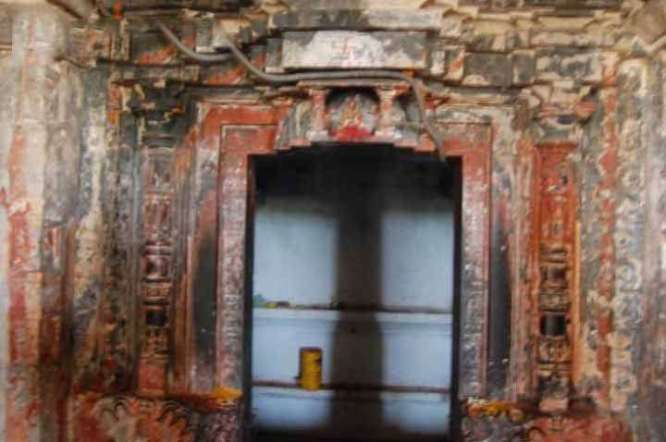 If one stands in front of Shiva Lingam in the inner sanctum they will find their own shadow divided into two postures behind the wall of the deity. Also, In Lord Vishnu garbhagriha, one can notice their hand waved, when standing in front of the deity, it splits into 5 shadow postures. The temple was built during Cholas period between 11th – 12th century. It is one of the ancient and historical pilgrimage sites in Telangana. The architecture and the pillar shadow on the deity show creative thinking & scientific knowledge of Kunduru Cholas. Panagal village in Nalgonda district is also home to other ancient temples like the famous temple Pachala Someswaralayam & Sri Venkateshwara Temple. Among different ways of worshipping (Shivaradhana – Shiva Nama Smarana, Shiva Rudra Patana, Shiva Dhyanam, Abhishekam, etc), he is most pleased by Abhishekam, hence he is called as Abhisheka Priya. Abhishekam to Lingam by chanting Lingastakam preferred.